Championship leader Valentino Rossi will start Sunday's final MotoGP race of the season from the back of the grid after a ruling by the Court of Arbitration for Sport (Cas). 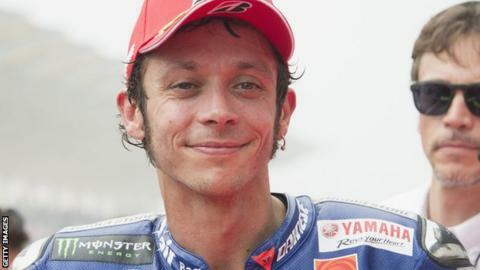 Italian Rossi, 36, was handed the punishment after clashing with Honda rider Marc Marquez in Malaysia. The nine-time world champion appealed to Cas and hoped to be able to qualify as normal for the race in Valencia. He leads Spain's Jorge Lorenzo by seven points, with 25 available for a win. Rossi had sought an "annulment or reduction of the penalty" but also a "stay of execution" to enable him to compete in qualifying this weekend. The latter element of his appeal was rejected on Friday, with Cas adding it was yet to make a final decision on the merits of the full case. Rossi last won the title in 2009 and will become the oldest champion in the premier class since Les Graham in 1949 if he is crowned on Sunday. If Lorenzo wins the race, Rossi must finish second to take the championship.